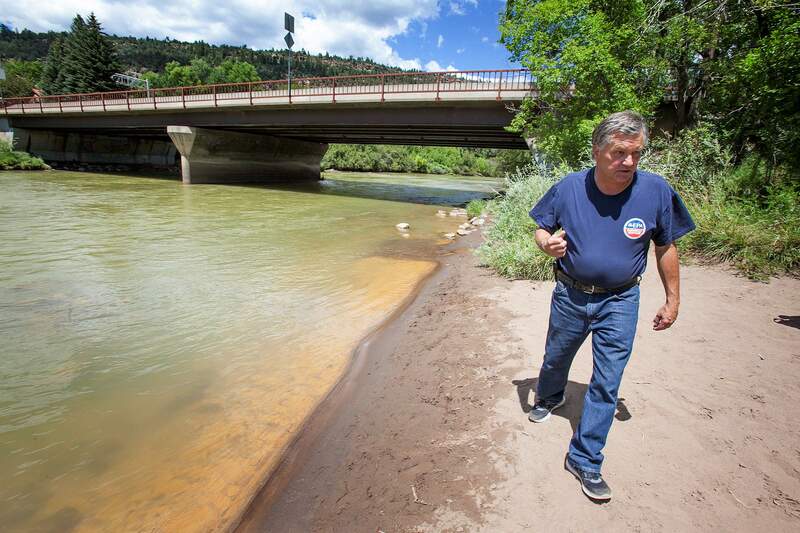 Peter Stevenson, on-scene coordinator for the Environmental Protection Agency, walks next to the contaminated waters of the Animas River on Aug. 9, 2015, at the 32nd Street bridge to observe water testing. The EPA has released a report that says there were no short-term or lasting impacts from the Gold King Mine spill, confirming what other groups have found. A new report from the Environmental Protection Agency found the Gold King Mine spill had no immediate or lasting impacts, similar to findings with other organizations’ conclusions in recent weeks. The EPA last week released a “Biological Response Report” that shows the agency’s analysis of the Gold King Mine spill. In August 2015, the EPA caused a blowout at the inactive mine north of Silverton, releasing 3 million gallons of mine wastewater laced with heavy metals into the Animas River. The study looked at the spill’s effect on aquatic life in both the Animas and San Juan rivers. It took into account data and samples from 30 locations from the Animas River headwaters around Silverton down to its confluence with the San Juan River in Farmington and into Lake Powell in Utah. Based on data from before and after the spill, the EPA “concluded there was no measurable changes to fish populations and bottom-dwelling organisms” after the Gold King Mine blowout. The EPA said aquatic life in the river near Silverton had already been killed off from decades of legacy contamination from historic mine ore processing and ongoing acid mine drainage contamination. In Durango, where aquatic life does exist, populations were not affected because the spill had been diluted, the metals were not toxic and the time of exposure was relatively short, the EPA said. The EPA said that while some fish accumulated metals after the mine release, water quality returned to normal when samples were taken the next spring. The study highlights what many researchers in the watershed have known for some time: The Gold King Mine spill’s tangible effect on the environment has been relatively small. Just days after the Aug. 5, 2015, spill, Colorado Parks and Wildlife placed more than 100 hatchery fish along the Animas River. None of the fish died. In August, San Juan Basin Public Health released the results of a three-year water-quality study, also finding the Gold King Mine spill had no lasting impacts. Mountain Studies Institute, which has extensively monitored the river since the spill, has long maintained aquatic life had not been seriously affected. Recently, the group released a study that showed the 416 Fire runoff was by far more impactful.